CFPB director Richard Cordray says supervising the credit reporting market "will help ensure that it works properly for consumers, lenders, and the wider economy." NEW YORK (CNNMoney) -- Credit reporting agencies will soon be subject to a deeper level of federal oversight. The Consumer Financial Protection Bureau announced Monday that it will begin supervising the nation's biggest consumer reporting agencies this fall. Consumer reporting agencies are private companies that collect financial data about millions of individuals -- often including past and present loans, debts and bankruptcies. Many financial institutions rely on reports from these agencies to determine the risk of applicants and to make lending and pricing decisions. The "vast majority" of the 113 million credit card accounts, auto loans, personal loans, mortgages and home equity lines originated last year were approved and priced based on data from these agencies, according to the CFPB. There are about 400 credit reporting agencies in the country, and about 30 will be subject to the oversight -- those with more than $7 million in annual receipts. Under the new rule that takes effect Sept. 30, the CFPB will be able to monitor business practices, conduct on-site examinations and write new rules. "Supervising this market will help ensure that it works properly for consumers, lenders, and the wider economy," CFPB director Richard Cordray said in a statement. "There is much at stake in making sure it is both fair and effective." 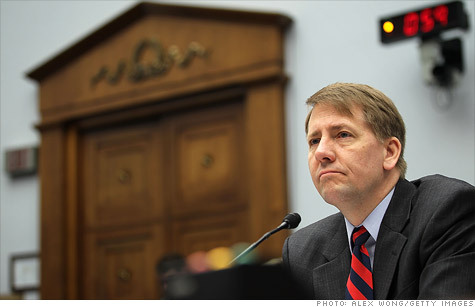 Cordray said that credit reporting agencies play a key role by helping financial institutions and other companies assess risk and prevent losses, but that some consumers may be unfairly blocked from credit they deserve. The consumer bureau has received complaints from many consumers who say their credit reports are inaccurate and that they are having trouble correcting them, he said. The rule will apply to the three biggest credit bureaus -- TransUnion, Experian and Equifax (EFX). The three issue more than 3 billion reports a year and each hold records on more than 200 million people. FICO (FICO), which provides the scoring algorithm most credit bureaus use to calculate credit scores, is not a credit bureau or lender, so it will not be subject to the new CFPB rule. The CFPB is starting out with three main areas of focus: whether data given to reporting agencies by lenders and others is correct; whether the data is being processed accurately; and whether the dispute resolution process is effective. 0:00 /1:55What really hurts your credit score? In addition, specialty agencies that collect checking account data instead of credit histories will also be subject to federal supervision. This category includes companies like ChexSystems, a consumer reporting agency that holds records about more than 300 million consumers that 80% of the nation's banks use to screen checking account applicants. Previously, consumer reporting agencies had to comply with federal laws like the Fair Credit Reporting Act. But they were never subject to ongoing supervision -- meaning no government agency has been allowed to conduct regular reviews of their business practices. The Dodd-Frank Wall Street reform law gave the new consumer bureau the authority to supervise nonbanks in the mortgage, payday and private education industries -- as well as nonbank "larger participants." Next on the bureau's agenda: debt collection. The CFPB said it plans to finalize a rule allowing it to supervise debt collectors this fall, and more "larger participant" rules will follow.